They say you always remember your firsts… and that couldn’t be more true for us. For our very first Student Spotlight, we want to introduce you to our very first student – Kerri Gebler. We met Kerri before we even officially launched the company, and she’s been with us ever since. 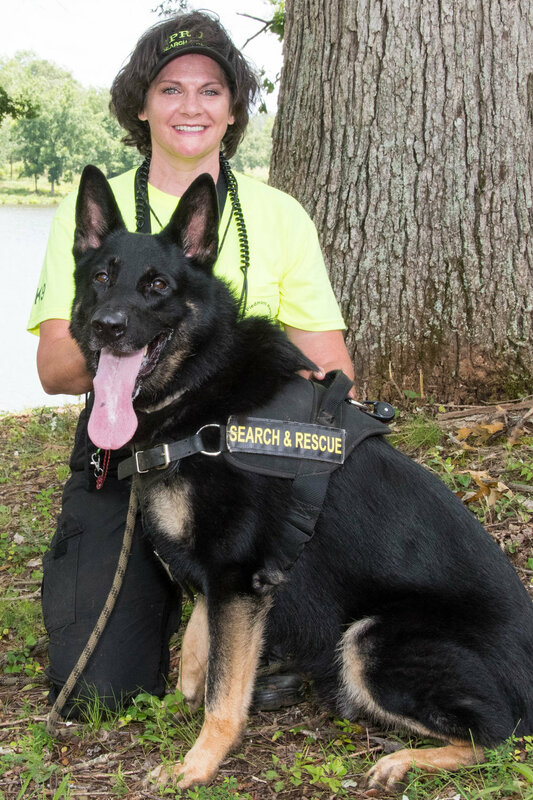 As a K-9 handler with Georgia Piedmont Search & Rescue Team, she’s in the woods a lot, and her ability to perform skillfully under pressure may literally be a life and death matter for a missing person. I train dogs and I train owners to train their own dogs. (The dogs are easy!) I'm also a freelance paralegal (part-time), writer, former home-schooling mother of four, and have managed restaurants. 2. What are your favorite things to do in the outdoors? I've enjoyed hiking and camping since I was a child, and have been fortunate to hike here in Georgia and in many places in the Rocky Mountains. But, my favorite things to do outdoors now all involve training my dogs for search and rescue, or helping others train theirs. 3. How did you learn about SARCRAFT? A weekend trip to Tennessee to work with a search team up there hosting a SAR-TECH II test in 2016 gave me the fortunate opportunity of meeting JJ and hearing about SARCRAFT before it had really launched. I needed to learn the skills to pass the SAR TECH II exam, and he has a very natural teaching style. He told me about what you guys were planning to do with your unique vision of turning these skills you both have into a business. 4. What was your favorite memory with us? It's not really fair to limit the answer to just one memory, because they've all been great. But, I'd have to say laughter around campfires followed by interesting night-time land navigation. That would be my first choice. My second choice would be learning how to use my compass, third would be the great food. Everything I've learned has been fun, though. The best part has been watching SARCRAFT grow and being a part of it. 5. How has training with SARCRAFT helped you in the field? Well, I can use both my Suunto and lensatic compasses now. That's a big deal. They didn't make a lot of sense until you guys had our team build a land navigation course. We've used the route search, area search, and man-tracking skills on actual searches. I've changed quite a bit of the supplies in my pack because of what I've learned with SARCRAFT, and my pack weighs less. 6. What skills and topics do you look forward to learning with us in the future? I'm really looking forward to the wilderness survival course, sheltering essentials, and anything else I can get up here to learn. I wish it wasn't a two hour drive through Atlanta traffic to get here, or I'd be here every weekend. I've enjoyed sharing your blog and web site with friends, and have had good reports from those who've taken classes with you. We love her wacky sense of humor, awesome positive attitude, and desire to always challenge herself to become better. She’s got a thing for impromptu nighttime land nav, too… ask her about it sometime. ;) We enjoy having her in class every chance we can. Thanks for the interview, Kerri! Hope to see you soon!